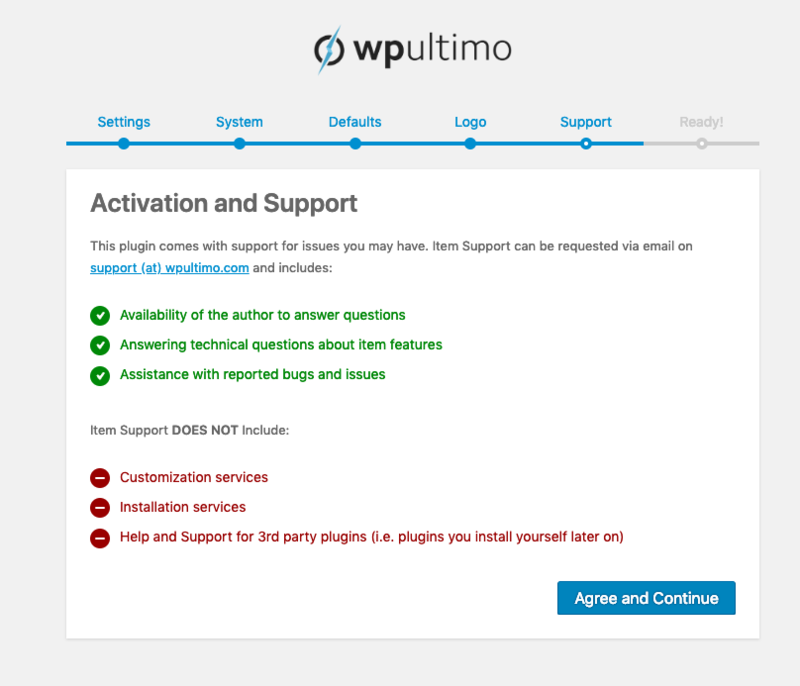 How do I install WP Ultimo? Just bought our plugin? Learn here how to install it! 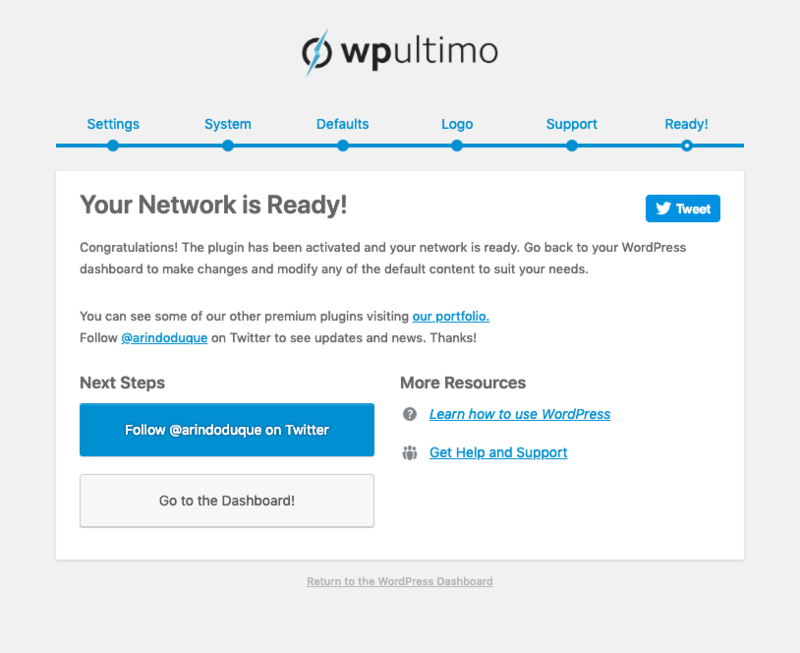 NOTE: This tutorial assumes that you already have your WordPress Multisite installed and configured. 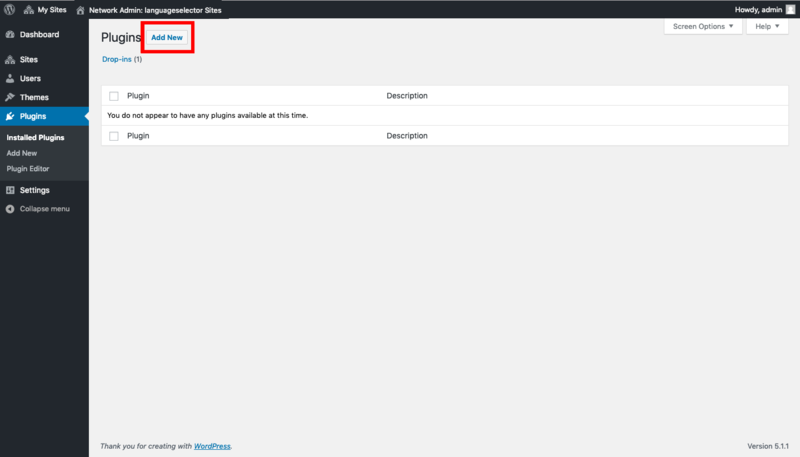 To see how you can install and configure WP Multisite, take a look at this tutorial by WP Beginner. 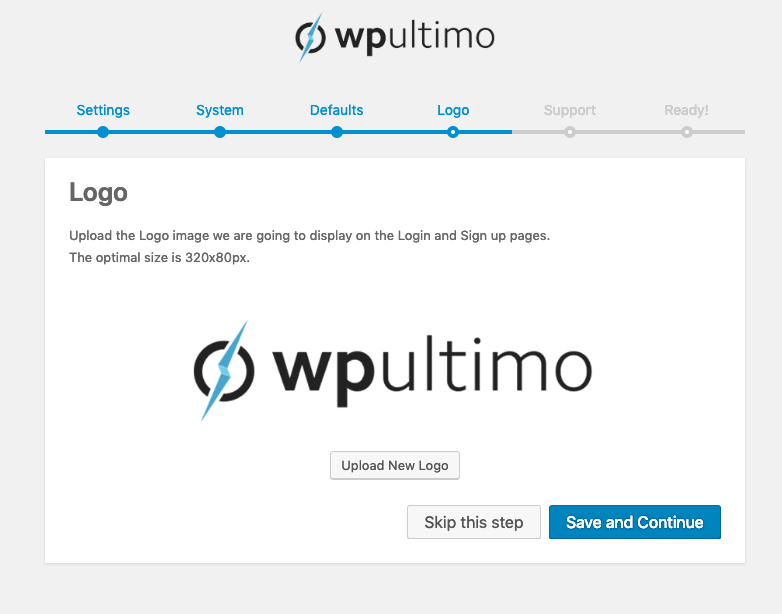 After finishing your WP Ultimo purchase, you will receive an email with the .zip file of our plugin. You can also download it from the client panel provided by Freemius. 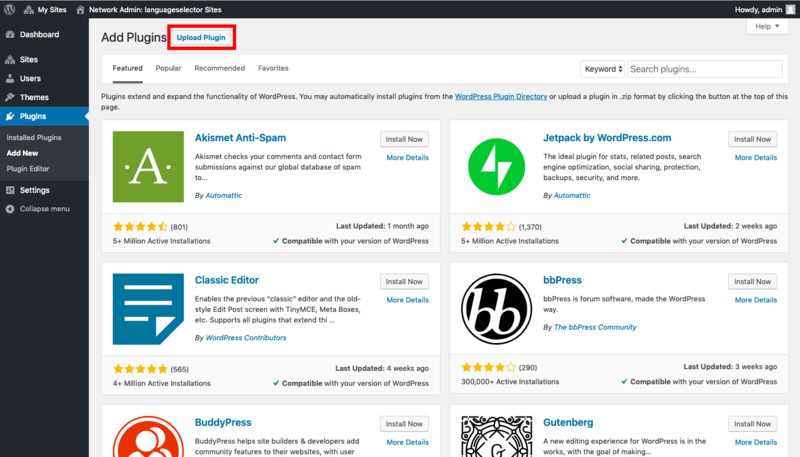 After getting the file, go to your network Dashboard and access the Plugins page. There, click Add New and then, Upload Plugin. 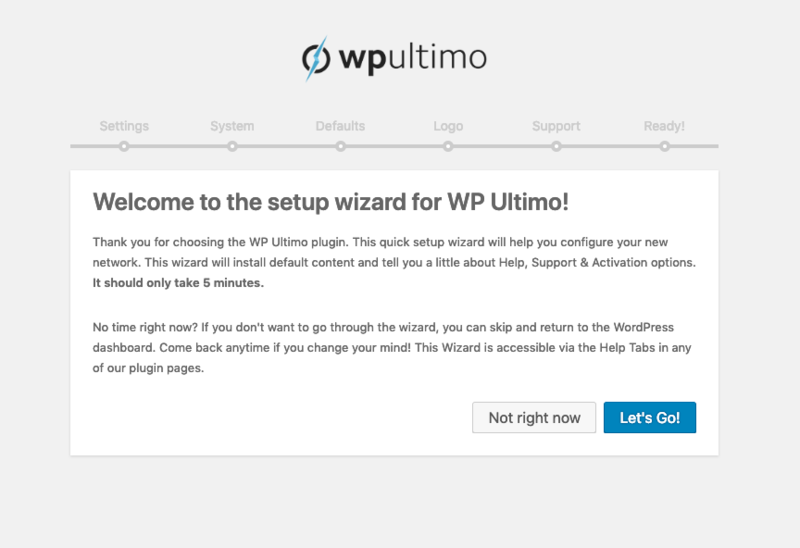 Choose the .zip file of WP Ultimo and click Install Now. You should receive a confirmation message. Right below this message click to Network Activate your plugin. That will redirect you to our Setup Wizard, where you are able to set up your network in few minutes by clicking Let's Go!. If you don't want to do it right after installing the plugin just click the Not not right now button. The Wizard is accessible via the Help Tabs in any of our plugin pages and you can do this later. First step allows you to change some general settings regarding features like gateways, registration, domain mapping, trial period, currency, and others. Second step concerns custom domain support. Follow the instructions on the page to enable this support. 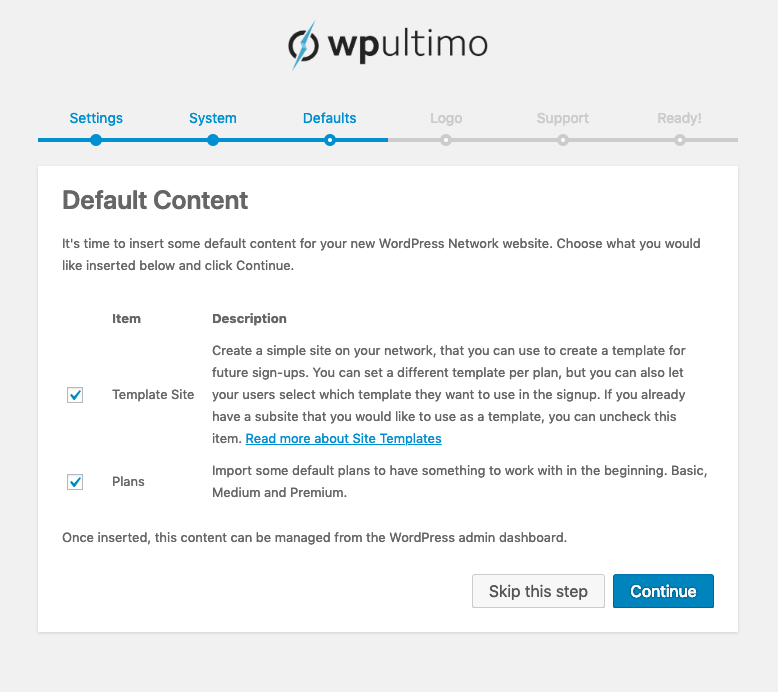 WP Ultimo also lets you start your network with some default content. You can configure if you want it or not in the third step of the Setup Wizard. In the fourth step you can upload your network logo, that will be displayed on login and sign-up pages. After that, you will be asked to agree to our support conditions shown in the fifth step of the setup wizard. Make sure you read everything our support includes! And this is all it takes! Click the button to Go back to Dashboard and start rocking with your network of websites! You're ready to rock with WP Ultimo! 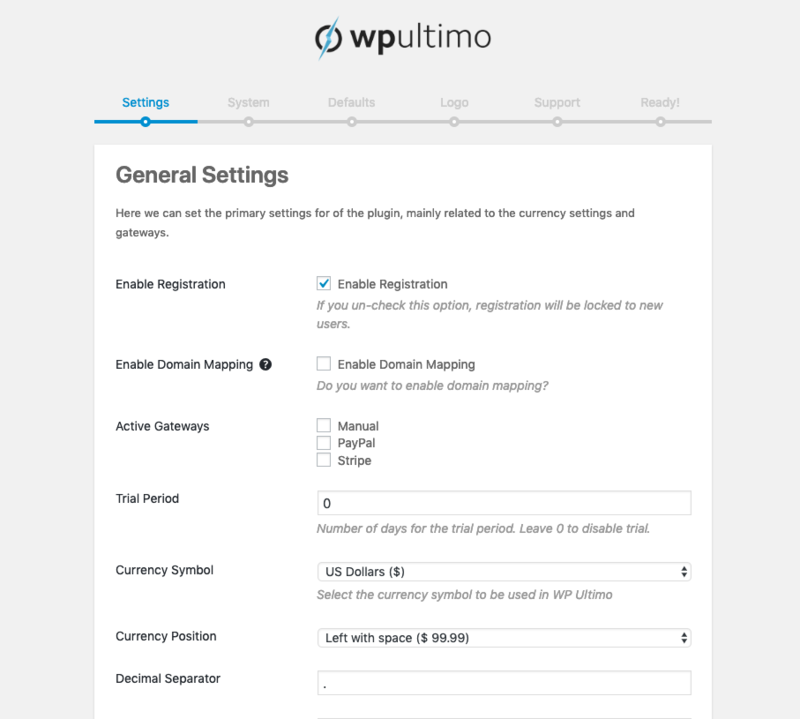 Now you have on the menu on your left all the WP Ultimo options that will help you managing your Website as a Service (WaaS) business! Go ahead and have some fun! 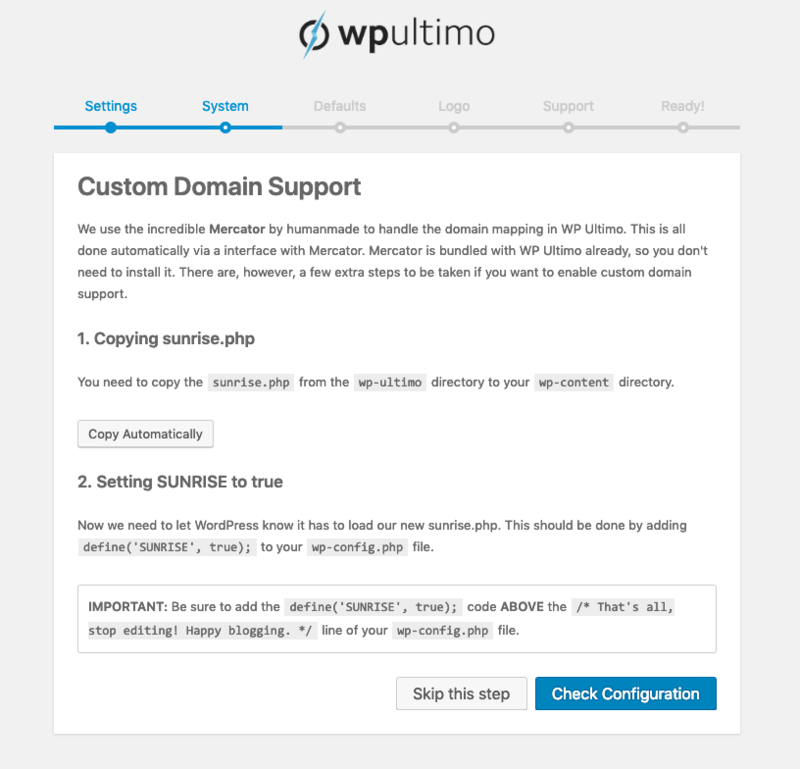 Take a look at the Getting Started section of our Knowledge Base and see what else you can do with WP Ultimo.